I am not a citizen but, having been born in a small town, I have always found it interesting to go to the big city. Now I also live with my girlfriend some nights per week. My favorite route starts from the Vanchiglia district, where I live, touches, after half a mile, the long Po Machiavelli and then the Antonelli one. 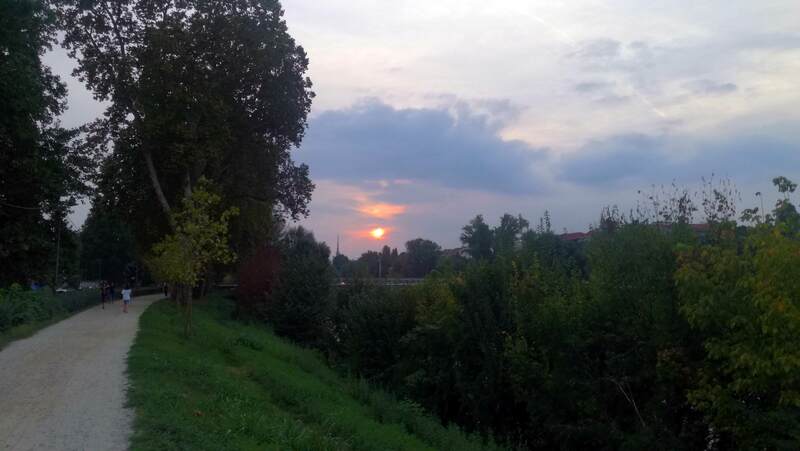 After about 3km are at the confluence with the Dora Riparia where through the bridge over the river and passes in Lungo Dora Pietro Colletta, inside the park of the same name, named after Pietro Colletta, an Italian patriot during Napoleonic period. In the longer races, those of 12-14 km touches the beautiful park of the Confluence, which sees Stura di Lanzo and Po flow together. The soil is almost completely compact and flowing: not too hot in summer, relatively cold in winter. Despite running in the city, I do not feel the weight of smog. The best month to run in my opinion, in my climate range is September. The temperature is perfect and dry. The standard route includes 10km, the heating is performed, with my girlfriend, making a ring that involves crossing the Regina Margherita bridge instead of entering the long Po Antonelli, follow the Viale Suor Giovanna Francesca Michelotti until at the second bridge, the Sassi, which see the circle close turning left, along Po Antonelli. For those wishing to try a similar venture, we usually deal with a 6x (4 + 2 ‘) combination (4 minutes of slow running and 2 minutes of walking, all repeated 6 times).